Calapooia Street on the west side of the post office will get driver’s-side back-in parking. Albany officials cite several benefits of the back-in diagonal parking that will be installed on three sides of the post office starting in January. They don’t mention the downside, which motorists will probably notice when they try to use the new setup. Note that most of the back-in spaces will be on the driver’s side on the one-way streets around the Albany PO. That’s all fine. But only right-side angled parking offers better visibility. And on two of the three blocks where angled slots will be provided, they are on the left or driver’s side of the street. This means that when the parking slot on your right is full and you pull out, you can see nothing of oncoming traffic until you’re in its lane. Even if the spot on your right is vacant, you can see traffic only if you twist your neck to look over your right shoulder, not that easy after a certain age. The new parking layout is part of Phase 1 of the city’s downtown streetscape project and is supposed to be finished in late March. 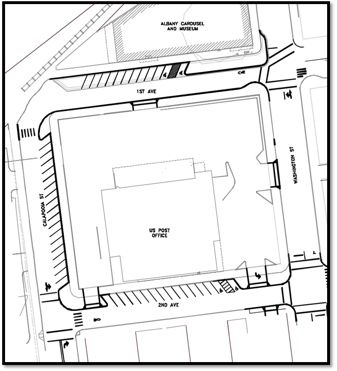 It will yield 47 diagonal parking spaces on First, Calapooia and Second, each space 9 feet wide. That’s about 20 more spaces than now, and that will be helpful, especially when the Albany Carousel opens later in 2017. Phase 2, on several other downtown streets and not involving angled parking, will be done later in the year. Both phases together are expected to cost around $8 million. 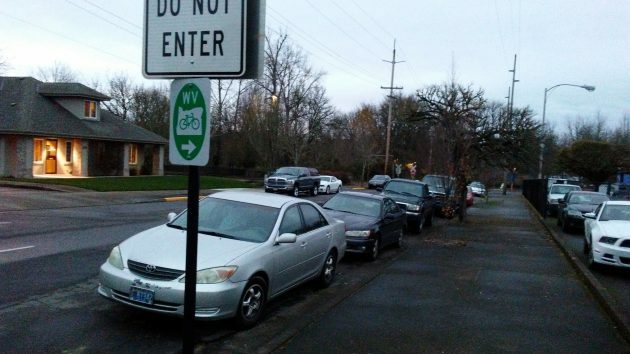 The nice people in both the Albany and Corvallis school districts who manage school bus driver-training programs shudder when they read Hasso’s excellent expose’ on the backing-in parking conundrum created by the addition of the CARA-Sell down on First Street. Why might they shudder? Because of the well-understood statistics on backing vehicles. While perhaps more true for large vehicles than for automobiles, the trend is the same. In the grand scheme of vehicular operations, the percentage of accidents when vehicles are backing-up is far greater even though cars, trucks and buses spend only 2% of their time backing. It doesn’t require any particular genius to understand. It is far more difficult to judge distance and space when looking in one’s rear view mirror. It becomes more challenging when the backing vehicle has one or more vehicles behind it, impatiently waiting for the vehicle to enter the parking space. Given this pattern around the downtown CARA-Sell, it seems certain we will have an increased number of fender benders and irritated drivers as vehicles struggle to back-in. Angry horn-blowers will enliven the downtown soundscape with various beeps, honks and curses. Ultimately, the decision to back-in to these spots will bring about an overall rise in auto insurance rates. Perhaps the City ought get into the insurance business. Park bench a safe distance away? This will be some good people watching … downtown Albany edition. Thank you Hasso for a second look at this parking plan. I hope our city officials will do the same. I propose a simple test to evaluate this layout. I request them to take three (city) vehicles to the east parking (#4) area at LBCC on a Saturday or Sunday. Access from Ellingson/Lanier Street. Then go the wrong way into the diagonal parking spots. Then the three cars just back-in park right next to each other. Then the first driver pulls out and parks the other side of the third car. Then the second car moves, parks a space away from the the just moved car #1. Now the third car can park between first and third. Now the drivers can get out and talk about their parking. One of the thinks to note is these diagonal parking spots there are just under/over ten feet wide. The plan around the Post Office is for nine feet wide. How would they do if there were others(kids) in their cars as they parked? I hope the parking plan is for thirty to fifty percent use of these spaces are for one time use visitors. What will their opinions be on parking in Albany? I may be full of bull in my writings, then again I’m looking forward to others to express theirs. The width of these new parking spaces, like many new parking lots, are not wide enough for my full sized pickup. And, I’m supposed to back into these spots? And then try to open my door to get out of my vehicle without my door hitting the vehicle next to me? The pickup usually sits out at home in the driveway, but when I do put it in our garage, that has 9 foot wide doors, I have to fold the mirrors in and then it still is a very tight squeeze. People whine about discrimination for so many different things now days. These parking places appear to be discrimination against large vehicle owners. That’s my 2 cent comment.